Many of you are hoping to hold your smaller, more intimate wedding in a Vegas hotel suite. And why not? It’s one of the most appealing options about wedding in the city. It can be casual, easy to do, relatively inexpensive and private. You also have a lot of control over the event – you set your own timeline, decorate how you like and hire the vendors you prefer to work with. However, although many of the fancy hotel suites on the Vegas Strip are fashionably decorated and come equipped with great views, they aren’t necessarily wedding ready. So, what are some things you can do to incorporate a little more of a “wedding” or celebratory feel into your simple suite wedding? I’ve teamed up with a guru of in-suite wedding ceremonies, officiant Angie Kelly of Peachy Keen Unions, to give you some tips on planning an in-suite wedding ceremony. Angie oversees hundreds of wedding ceremonies in hotel rooms across Las Vegas every year, and often helps her brides and grooms get their wedding suite into tip top shape before the nuptials. She has a lot of great tips and insight into what works for wedding decor in an in-suite wedding … and what doesn’t! Read on to get Angie’s advice when it comes to in-suite weddings! Buy the best suite you can afford, with a separate bedroom area if possible. Angie’s personal favorites? The luxe two and three bedroom Penthouses at Trump Las Vegas, the Salon Suites at Wynn Las Vegas, and the Pool Villa Suites located within Hard Rock Hotel’s Paradise Tower – which are perfect for the ceremony and after party. For receptions, the two bedroom Palms Place condos, suites at the Golden Nugget downtown and various Mandalay Bay suites are also in the running. For larger groups, be cautious of heavily furnished floor plans such as the Wraparound Terrace Suites at Cosmopolitan, says Angie. They’re gorgeous, swanky and trendy, but not the best layout for exchanging vows, she says, especially if there are more than 10 people. Casual does not have to be synonymous with messy. Ahead of the ceremony, tidy the room, hiding suitcases and personal belongings, or do not sleep in it to keep it fresh. Decorate ahead of time, or appoint a planner or friend to do it for you. Set a clear timeline for the order of events to make things more official. Your officiant, photographer and guests, regardless of how many there are, will appreciate it! To help distinguish the important moments of the day, you might have the bride make her official entrance from behind the bedroom door, or even from the hallway. After the kiss, a change in music and having a champagne toast ready will help move things forward to the reception portion of your wedding, or is just a sweet way to mark the moment while staving off any awkwardness. Consider the space needed between you and the officiant for the ceremony. Intimate does not have to mean squished! Angie recommends a distance of approximately 7 feet between the officiant and the first row of guests. This allows for better projection and space for the photographer to roam. You don’t have to go far from most Strip hotels to zazz up your suite for the ceremony. For decor Angie recommends visiting a drugstore like CVS or Walgreens (both with several on Strip locations) to pick up electric votive candles. Dimming the lights and closing the curtains behind your makeshift altar help also create a mood – the latter making for a less busy background behind the vows, and making for better photography with less reflectivity. You might also like to set aside a little in your budget for flowers to make it feel special and more like a party. Most floral shops will delivery to major hotels. 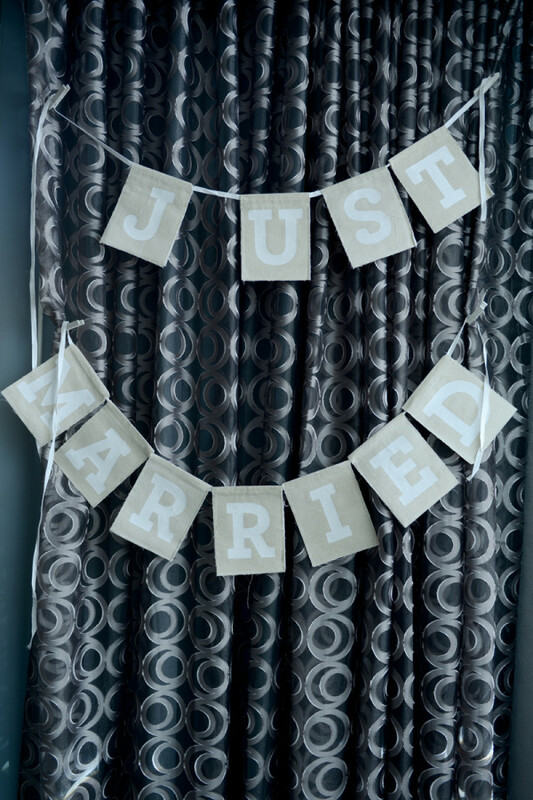 Bringing a light paper banner or bunting reading “JUST MARRIED” with you to hang off a curtain or above the cake table is a nice touch. Buying or renting an aisle runner also helps the room feel a little more wedding ready. A table with framed photos of you two alongside a guestbook is also a nice touch. Moving furniture around is almost a given, says Angie. Rearranging things for the best space usage means you may lose seating, however. Consider bringing in rental chairs for a more formal setup and to give everyone a seat. Assign mini tasks to everyone, to help them keep busy and get involved; and to help take a load off! Let your brother get the champagne flowing as soon as the kiss happens, give aunt Joan the job of receiving and setting up any food, and cousin Taylor the job of setting up the streamers and candles. You might even consider giving everyone the day off and hiring a professional to bartend or set up the event. Allow for extra time to sort out technical issues ahead of time when it comes to using music and sound, or setting up Facetime or Skype for those joining in via cyberspace. There will almost certainly be an issue, and you don’t want to be stressing out at the last minute over WiFi on your wedding day, do you? 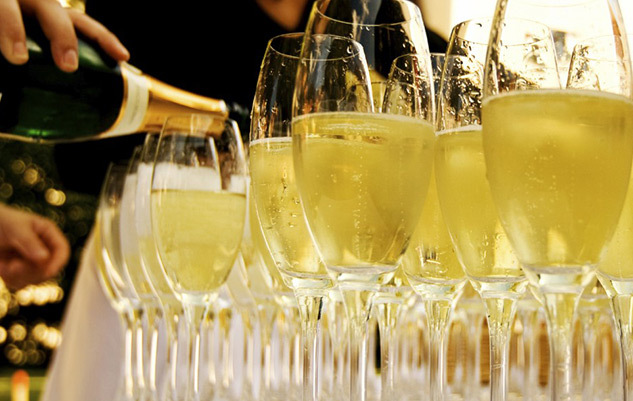 Refreshments do not need to be fancy, but a champagne toast is easy to do, and a cake or cupcakes are a sweet treat. Many catering companies will also supply light snacks and finger foods instead of an entire meal. 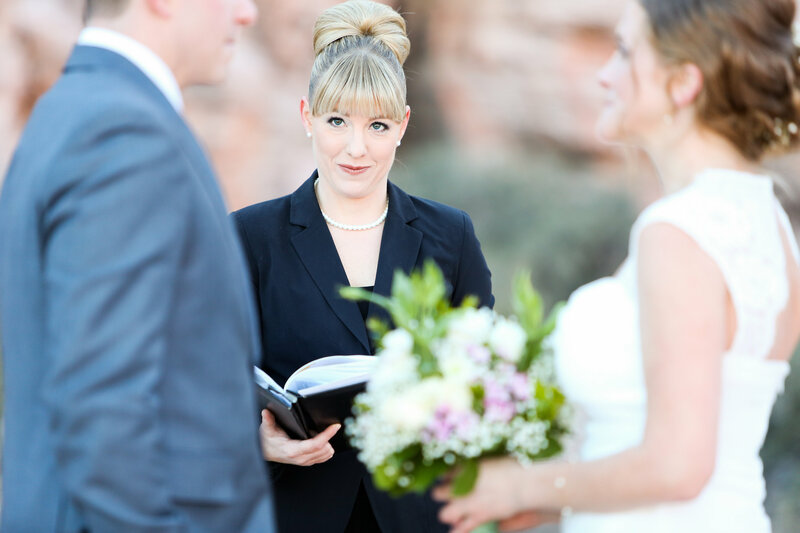 Trust your officiant, event coordinator or wedding photographer. They’ve done this many, many times and know what works and what doesn’t. Take their advice to heart! Thank you so much, Angie! It’s so wonderful to hear that an in-suite wedding doesn’t have to be expensive or elaborate to be elegant and memorable. If you are looking for more information on hosting an in-suite wedding, read about DIY suite receptions and check out some real in-suite wedding ceremonies and receptions featured on Little Vegas Wedding.